by Melanie ~ Louisville, Miss. As I looked back through my journal from our trip, there were several things that stood out to me that I would like to share. Many times people will tell you that when serve on a mission team, we ourselves are changed just as much the people we serve, and I would have to agree. Upon our arrival, one of the first things I remember us doing was going over from the Dominican into Haiti. It was Sunday, and we got to experience a church service in the church at the Promise Land. As Tim told us many times, Pastor Vilma is so important in his community and I can see why. We saw the church building where they had been meeting, which was little more than a thatch shack where they were now holding Children’s Church. About 20 little children from 3 to probably 15 were reciting Bible verses aloud that they had memorized. This was amazing. We then went to the church building where the people were meeting and although we could understand very little of what was being said, Jesus Christ’s presence was felt inside the four walls of that church. As the people sang, it was such a beautiful testimony of their faith. The words they sang came alive and you could see what strong faith they had in their Lord and Savior. They didn’t have other distractions getting in the way of that and it was beautiful. And when they prayed, they prayed out loud all at once, and it seemed to me God met those prayers before the sound reached the roof – such a beautiful sound (might be something we want to try here at our church sometime). Most of the people we came in contact with seemed happy. And this happiness wasn’t worldly happiness but joy. Part of this was because they didn’t know a lifestyle any different, but the true joy came from knowing Christ. They are taught about Him in their church and school, but they have a much deeper understanding of FAITH in Him. It seemed for many, that was all they had. We were around the school children each and every day. All the teaching is oral as very few had money to buy paper and pencils. From tiny little ones to high school aged, it was a joy to hear them speaking and reciting their lessons. As we held them, played with them, and loved on them, we were showing them Jesus, and we let the little children come to us, jump on us, play with our phones, and gave them all we had. 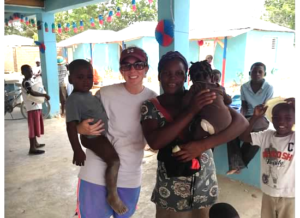 As we interacted with the people of Haiti, DR, and each other, so much love could be felt. Again, I know that Jesus was in our midst. Hopefully instead of playing with us, they saw Him in our eyes. Coming home was hard, because it seems like there was so much to do. Like we did so little. But Tim said this on our last night there: “Even if you start something, God can finish it.” I know God has some very special things in store for the people of Anse-a-Pitre, the DR, and other cities in Haiti through the work of HMM. Many lives have been saved not only here on earth, but for eternity, which we know is all that matters. I feel extremely blessed to have been a part of this trip and hope that when these beautiful people of Haiti think back to our time there, and all the other people who have visited them and shared God’s love with them, that they don’t see us, that they see their Savior, with whom they will one day live in paradise and have beautiful crowns of righteousness for the suffering they endured while on earth. Like 1 Timothy 6:17 says, “Command those who are rich in this present world not to be arrogant nor to put their hope in wealth, which is so uncertain, but to put their hope in God, who richly provides us with everything for our enjoyment.” The people of Haiti taught me this verse. I learned that life doesn’t come from things – it comes from following Jesus. I have never seen this more clearly! My hope is, God willing, I can continue not only to be a part of this great mission to Haiti, but here at home too!